If your dog is recovering from injury or surgery, then your vet may have advised a few weeks of either “crate rest” or “room rest”. 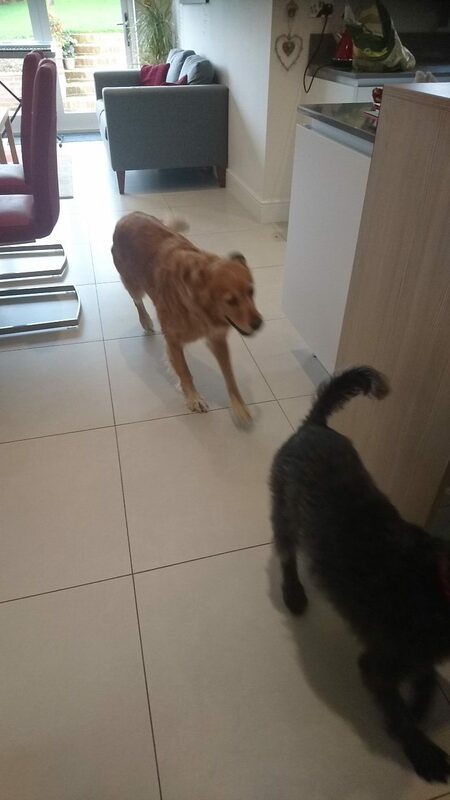 Confinement to a crate, dog pen or small room helps prevent your dog from damaging him or herself by running about, jumping on and off furniture and using the stairs. This part of the website is being developed into an owner advice resource on crate rest and room rest. Please read on to learn more about home-care for the recovering dog. For more specific advice, you can either follow the clickable links below, scroll to the bottom of the page for downloadable notes, or use the menu at the right hand side of the page. Above: This is a good-sized crate for a small terrier like Mac. He did well with this set-up, but some dogs would need a bed without raised edges. Your dog will be in the crate, pen or recovery room for nearly 24 hours per day, perhaps for weeks at a time. This space will be your dog’s world for much of this time, so do take care to set it up comfortably. For tips on keeping your dog comfortable during the recovery period, please click here. 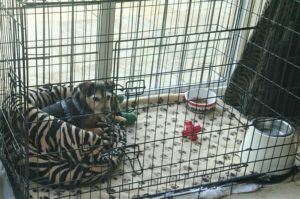 If your dog is to recover in a crate or indoor pen, then click here for further advice. If your dog is to recover in a room (“room rest”), please click here for more information. For social media discussion on the subjects of crate rest, room rest and recovery, please follow the Recovery Space Dog Welfare Project page on Facebook by clicking here. All are welcome, including dog owners, vets, nurses and physiotherapists. Above: Running, chasing and slick floors are too risky during recovery. Walk very slowly when your dog is on the lead. This helps your recovering dog to use each paw properly. Choose a sturdy, purpose-built crate. An open-top dog pen can be used if your dog will definitely not try to escape. The crate should be big enough for your dog to lie fully stretched out, to sit or stand facing in a choice of directions, to yawn and stretch, to eat, and to lick or chew at toys. Choose a position for the crate that will stay comfortable all day and all night. If possible, get the crate before it is really needed. Set the crate up comfortably with bedding, toys, food and water before showing it to your dog. Introduce your dog to the crate gradually (over several days if possible). Cover the base of the crate with non-slip matting. Put comfortable bedding on top of this. When opening the crate door, take care that your dog does not try to run out past you. If you leave the dog with a harness on at all times, then its top strap can act as a safety “grab handle”. Your dog must not jump on furniture in the recovery room. Remove any armchairs, beds, sofas etc. if needed, or choose a different room. Above: It’s healthy for dogs to stretch during recovery. 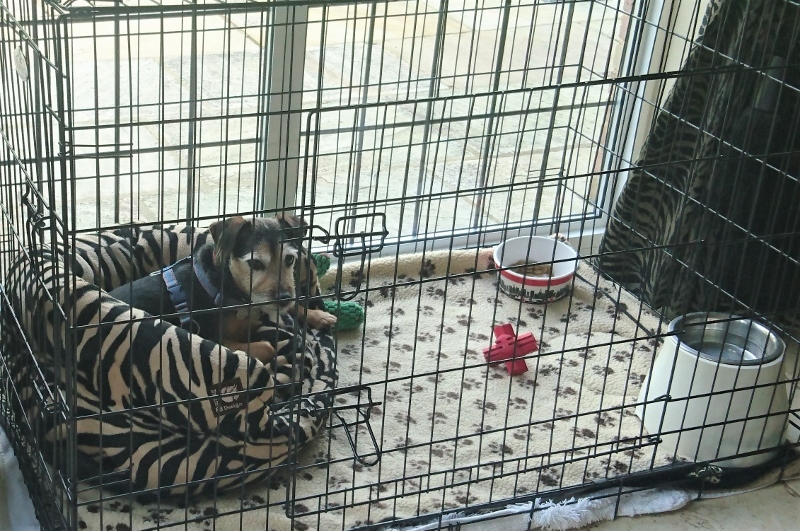 The crate, pen or recovery room should give your dog enough space to stretch and to change position comfortably. Why does my dog need crate rest or room rest?